The new modular SIMATIC S7-1200 controller is at the core of our new offering for simple but highly precise automation tasks. The SIMATIC S7-1200 controller is modular and compact, versatile, a secure investment, and is powerfully fit for a full range of applications. A scalable and flexible design, a communication interface that fulfills the highest standards of industrial communication and a full range of powerful integrated technology functions make this controller an integral part of a complete and comprehensive automation solution. The optimized performance of our SIMATIC HMI Basic Panels, designed for seamless compatibility with this new controller and the powerfully integrated engineering system, ensures simplified development, fast start-up, precise monitoring and the highest level of usability. It‘s the interplay between these products and their innovative features that give you an unprecedented level of efficiency for small automation systems. All SIMATIC S7-1200 hardware has been specifically designed to save space in the control panel. For example, CPU 1214C has a width measuring only 110 mm and both the CPU 1212C and CPU 1211C are only 90 mm wide. Together with the small footprint of the communication modules and signal modules, this modular and compact system saves valuable space and offers you the highest level efficiency and flexibility during the installation process. Up to eight signal modules can be connected to the largest CPUs for the support of additional digital and analog I/Os. One signal board can be connected to all CPUs, allowing you to customize the CPUs by adding digital or analog I/Os to the controller without affecting its physical size. The modular concept provided by the SIMATIC S7-1200 allows you to design a controller system to exactly fit your application needs. Up to 50 KB of integrated work memory is provided with a floating boundary between the user program and user data. Up to 2 MB of integrated load memory and 2 KB of integrated retentive memory are also provided. The optional SIMATIC Memory Card provides an easy way to transfer programs to multiple CPUs. This card can also be used for storing miscellaneous files or to update the firmware of the controller system. The integrated PROFINET interface is used for programming, as well as for HMI and PLC-to-PLC communication. Additionally, it supports communication with third-party devices using open Ethernet protocols. This interface features an RJ45 connector with auto-cross-over functionality and provides for data transmission rates at 10/100 Mbit/s. It supports up to 16 Ethernet connections and the following protocols: TCP/IP native, ISO on TCP, and S7 communication. Integrated technology for counting and measuring, closed-loop control and motion control make the SIMATIC S7-1200 an extremely versatile system for many types of automation tasks. Two high-speed outputs are integrated into the SIMATIC S7-1200 controller for use as either pulse train outputs or pulse-width-modulated outputs. When configured as a PTO, a 50 percent duty cycle pulse train is provided at a rate of up to 100 kHz for the open-loop speed and position control of stepper motors and servo drives. Feedback for the pulse train outputs is provided internally using two of the high-speed counters. When configured as a PWM output, a fixed cycletime output with a variable duty cycle is provided for controlling the speed of a motor, position of a valve, or duty cycle of a heating element. The SIMATIC S7-1200 supports the open-loop speed and position control of stepper motors and servo drives. This functionality is easily configured using an axis technology object along with the internationally accepted PLCopen motion function blocks included within the engineering system SIMATIC STEP 7 Basic. Absolute, relative and velocity moves are supported in addition to home and jog functions. 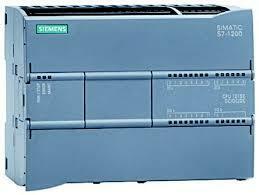 The drive commissioning control panel included with the engineering system SIMATIC STEP 7 Basic simplifies the start-up and commissioning of stepper motors and servo drives. It provides both automatic and manual control of a single motion axis as well as online and diagnostics information. The SIMATIC S7-1200 supports up to 16 PID control loops for simple process control applications. These control loops are easily configured using a PID controller technology object and the supporting editors provided within the engineering system SIMATIC STEP 7 Basic. Additionally, the SIMATIC S7-1200 supports PID auto-tuning to automatically compute the optimum tuning values for the gain, integral time and derivative time. The PID commissioning control panel included within SIMATIC STEP 7 Basic simplifies the loop tuning process. It provides both automatic tuning and manual control capabilities for a single control loop and it also provides a graphical trend view of the tuning process.